PLUS Pittsfield Skate Park Sessions While School Is in Session? Tammy Daniels, managing editor of iBerkshires.com joins TLC to talk about the some exciting news concerning Massachusetts’ (probable) oldest online-only newspaper. WGBY will feature the Berkshires’ extremely popular source for information on “Connecting Point” in the near future. Artists Aerial Rendering of the proposed museum of Extreme Model Railroad and Contemporary Architecture; submitted photo. Tammy Daniels, managing editor of iBerkshires.com joins TLC to talk about the proposed developments to the Greylock Cultural Corridor. First though, we hear from Katherine Cortes, who describes the first ever “Craft Fair on the Hill” taking place at Pine Cobble School December 12.
collage assembled from images courtesy Craft Fair on the Hillvia Facebook. Participants in Railroad City Youth Project's 2014-2015 culinary apprenticeship program; submitted photo. 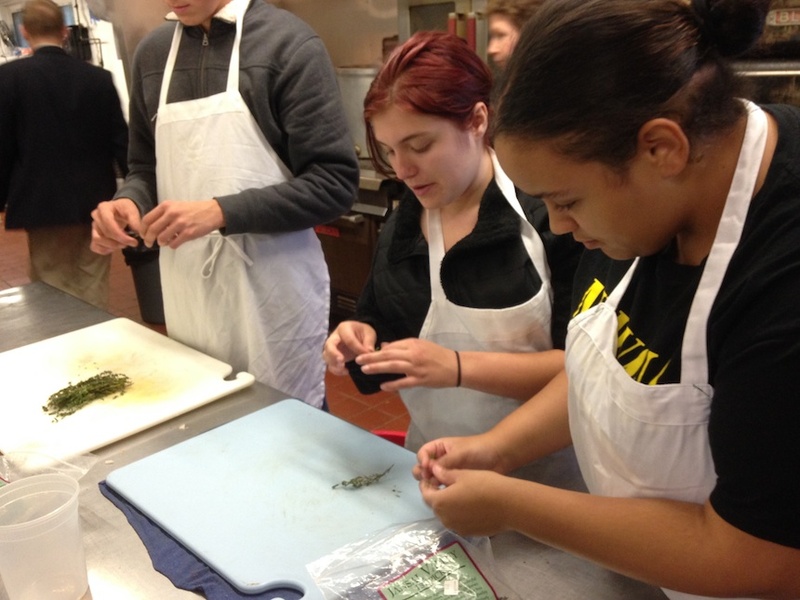 Chelsea Fosella (left) and Jennaya Jones practicing their skills during Railroad Street Youth Project’s 2014–2015 Culinary Apprenticeship Program. Jennaya, in her seventh culinary apprenticeship with RSYP, is now an intern at Red Lion and hopes to attend the Culinary Institute of America next year; submitted photo. GREAT BARRINGTON, Mass. — Youth empowerment organization, Railroad Street Youth Project , serving young people in southern Berkshire County, is getting ready for dinner. Its much-anticipated Annual Culinary Arts Celebration will take place on Monday, December 7th at 5:30 p.m. at Crissey Farm. This evening is the culminating event for the RSYP Apprenticeship Program (RAP), which offers work-based apprenticeship opportunities to young people in southern Berkshire County.